My husband and I just returned from 4 fun filled days in Boston. 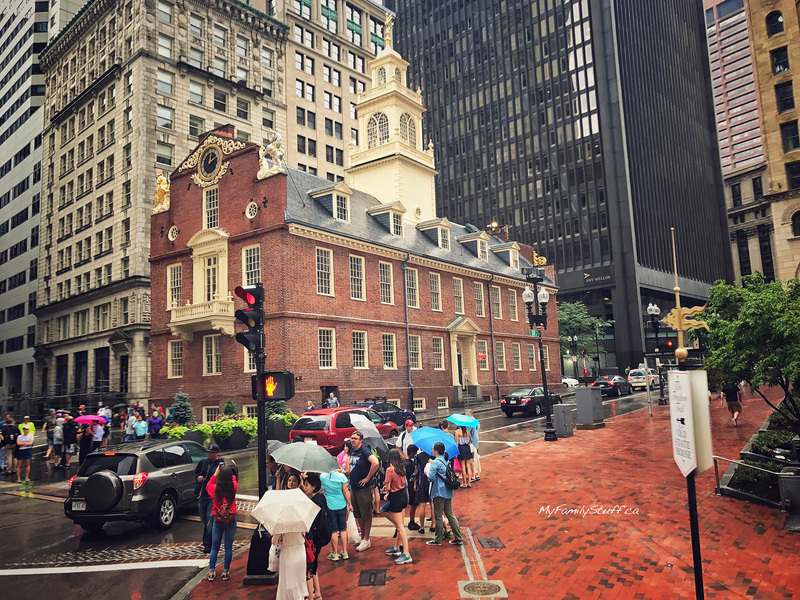 We had never visited this city in New England before and wanted to learn and see as much of it as possible. 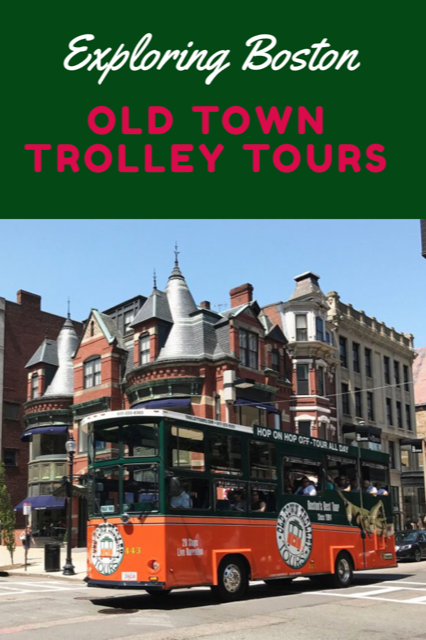 We decided that taking a hop on and off trolley tour with Old Town Trolley Tours would be the best way to go. Old Town Trolleys are comfortable trolleys with open air windows. Each trolley has a professional guide that shares great tidbits and information about Boston that you wouldn’t necessarily get from a guide book. 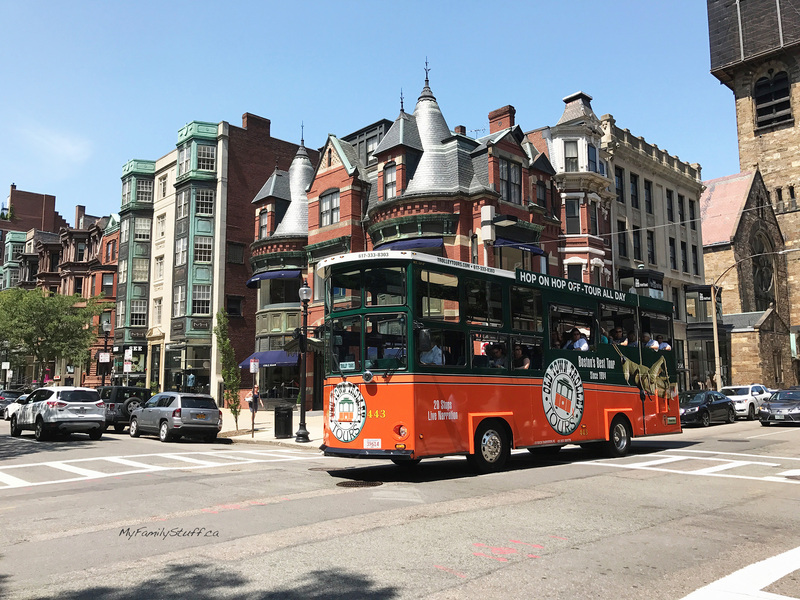 The Boston hop on and off trolley tour has 19 stops. 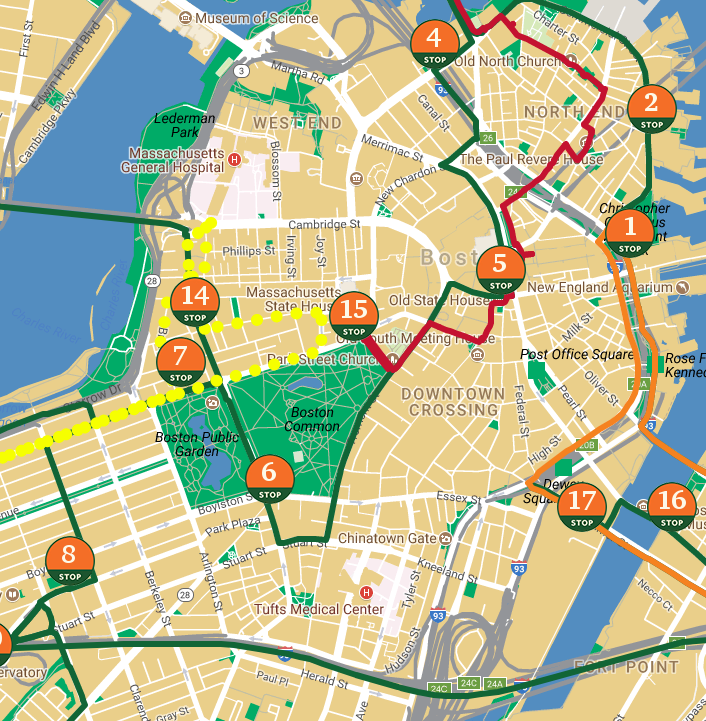 Stops include Boston Common, Cheers bar, Copley Square and Fenway Park. We started the tour at the Faneuil Hall stop. After checking in with an agent we got in the lineup for the next available trolley. 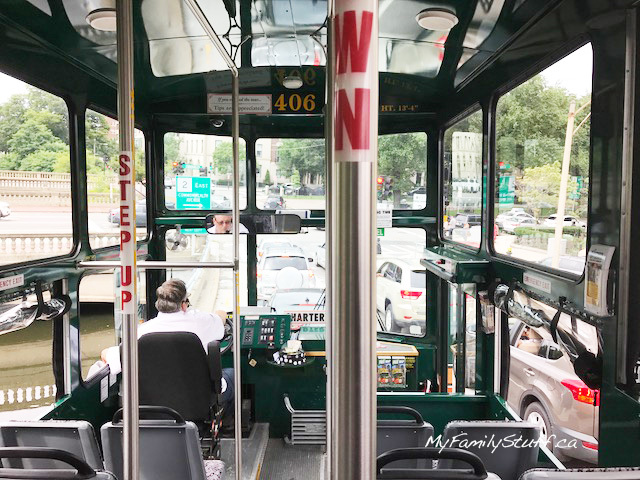 We had a sudden downpour on our trolley tour day and were so grateful that the staff at Old Town Trolley provided umbrellas while we were waiting for our trolley to arrive. We had to wait for a few trolleys before our group could get on but were impressed that the staff noticed this and sent an empty trolley for us. 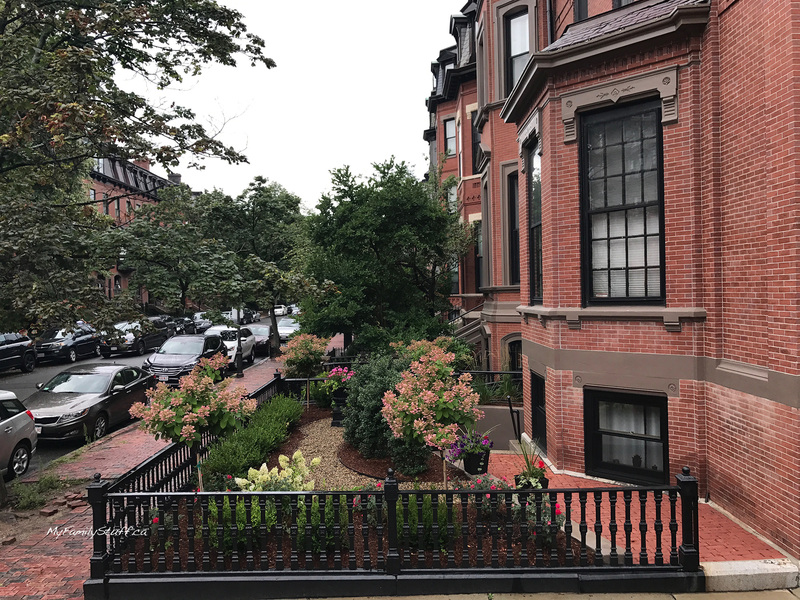 Our driver introduced himself once we hopped on and we were immediately ready to learn more about Boston. Since it wasn’t a bright sunny day, we decided to stay on the trolley for quite some time before getting off. We listened to great information about the USS Constitution and Museum, the Old State House (where the Declaration of Independence was read from the balcony ) and the Boston Public Library. We hopped off at stop #10 because we wanted to have lunch and check out the Prudential Center Sky Walk. After a short break, we hopped back on a trolley and continued the tour. Highlights after our break included Copley Square and Fenway Park. Our trolley continued onto Cambridge where we hopped off to check out MIT. After visiting MIT we decided to head to Harvard. Our driver clearly explained how to get there since the trolley route does not stop there. We ended our day at Harvard and made our way back to our hotel by public transportation ( the last pickup from MIT on our tour day was 5:00pm). I strongly feel that taking a tour on Old Town Trolley Tours is a great way to see the city. Their experienced guides have so much great information to share and are very friendly. I enjoyed the convenience of hopping on and off as much as you like. I also appreciated the comfortable seats on the trolley. I feel that taking an Old Town Trolley tour is great for couples and families. It’s the best way to learn more about a city if you are only visiting a city for a few days. You can purchase your Old Town Trolley tickets online or in person at many of their booths throughout Boston. The online price for a 1 day tour is just $37.76 for adults and $18.86 for children. Old Town Trolley Tours also have a 100% Money Back Guarantee. I’d love to know, have you taken an Old Town Trolley tour before? If so, in which city? Disclosure: Old Town Trolley Tours provided passes to facilitate this review. I really enjoyed the tour and would absolutely take one again. All thoughts and opinions are my own. This sounds like a great way to tour Boston! sounds like a lot of fun, something I would enjoy very much!